Do you have an upcoming tournament with 30 teams and need a printable bracket then don’t leave this page, man! Whether you’re on the tournament organizing committee, participating in the tournament, or just there to support, you’ll need a printable bracket to keep track of all the game action that comes with thirty teams. That’s because with a tournament bracket you can stay updated on the latest games and get a sense of the larger tournament standings with any one of our printerfriend.ly brackets, which are available in a variety of layouts and formats. What is a 30-Team Bracket? Tournament brackets vary in scope based on the amount of teams participating. A 30 team bracket doesn’t work out as evenly as a 4, 8, 16, 32, or 64 team tournament would. In addition to an even number of teams (which a 30-team bracket has), there also needs to be an equal number of brackets as teams advance into the following rounds. Even though 30 competing teams is an even number, the first round would end up with an odd number of teams moving into the next round, which means one team would not have a match up. That means a 30 team bracket will require a play in game or eight. Our single-elimination, twenty-four team downloadable brackets comes in a variety of options! You can download and print them out in PDF, full-size image (JPG) or in Excel. Below is the high-res image of our 30-team bracket. 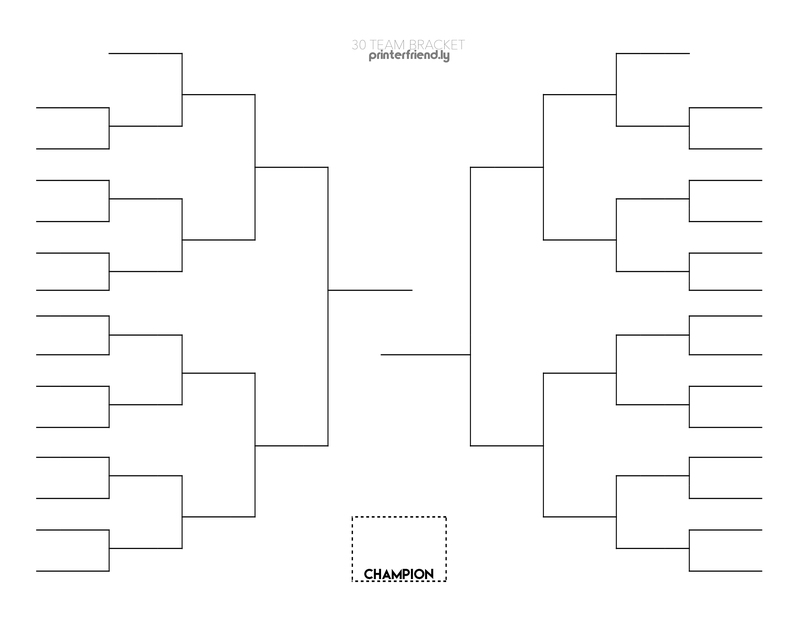 In order to download our Excel version click here: 30 Team Printable Tournament Bracket XLSX or if you’re a PDF kinda person, then you can download and print our 30 Team Printable Tournament Bracket PrinterFriendly PDF. These brackets have no gender so you can print them for a girls or women’s tournament, or a men’s tourney. Our brackets are also sport-agnostic meaning they’re not limited to the big sporting events like football, basketball or hockey tournaments. As long as the tournament is single-elimination then our printable, blank brackets will work with any tournament. Some of the team sports that our printable brackets will work with include the above mentioned as well as baseball, volleyball, lacrosse, rugby, dodgeball, beach volleyball and soccer. The brackets can be used for some individual sports such as tennis or wrestling.